Beijing (AFP) - Northern China choked under some of the worst smog this year on Monday, with Beijing's pollution soaring to 22 times healthy limits, triggering the city's second-highest air alert on the eve of global climate change talks. Thick haze blanketed cities across the country after President Xi Jinping arrived in Paris for the talks where China, the world's largest emitter of greenhouse gases, will be central to discussions. Concentration of PM2.5, tiny airborne particles which embed deeply in the lungs, reached over 560 micrograms per cubic metre in the capital, according to the US embassy -- well over the recommended maximum of 25 micrograms. 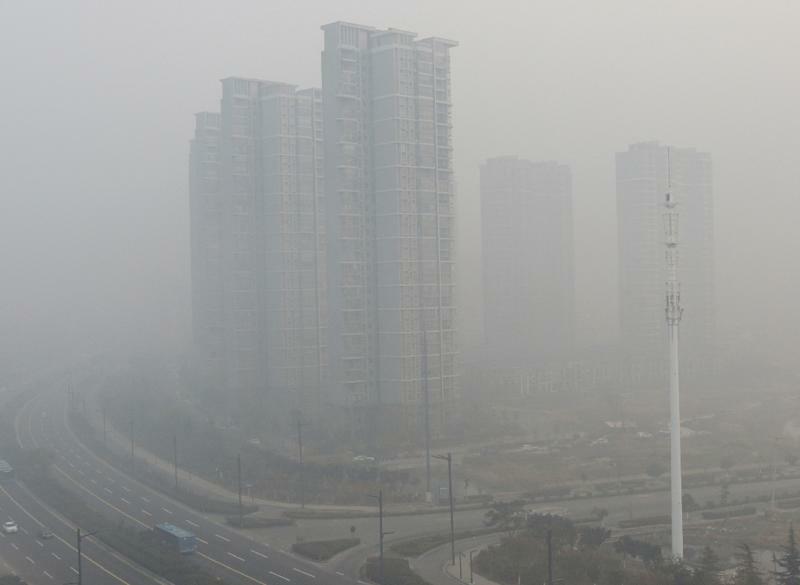 Levels in several cities in neighbouring Hebei province were also well above 500, official figures showed, more than twenty times the World Health Organization's advised limit for daily exposure. "You can't even see people standing directly in front of you," wrote one disgruntled commuter on Chinese Twitter-equivalent Sina Weibo. "It feels like even the subway station is full of haze." Several hundred freeway toll gates were forced to close in nearby Shandong province as visibility fell to less than 200 metres, the official Xinhua news agency said. Beijing issued an orange-level pollution alert over the weekend, the highest of the year, with residents advised to stay indoors and some industrial plants ordered shut. China has a four-tier warning system. Red, indicating the most severe pollution, is almost never used. Visibility in the capital was so poor Monday that the tops of skyscrapers were largely obscured from view at ground level. Many pedestrians chose to forgo masks, even though PM2.5 can play a role in heart disease and lung ailments such as emphysema and cancer. The pollution has been linked to hundreds of thousands of premature deaths, becoming a major source of popular discontent with the government. Beijing's severe pollution follows a bout of record-breaking smog in northeastern China last month, when PM2.5 levels reached 1,400 micrograms per cubic metre in the city of Shenyang -- the highest ever registered. It also recalled intense pollution -- dubbed the "airpocalypse" -- that garroted the capital in 2013 when readings approached 1,000 micrograms per cubic metre. 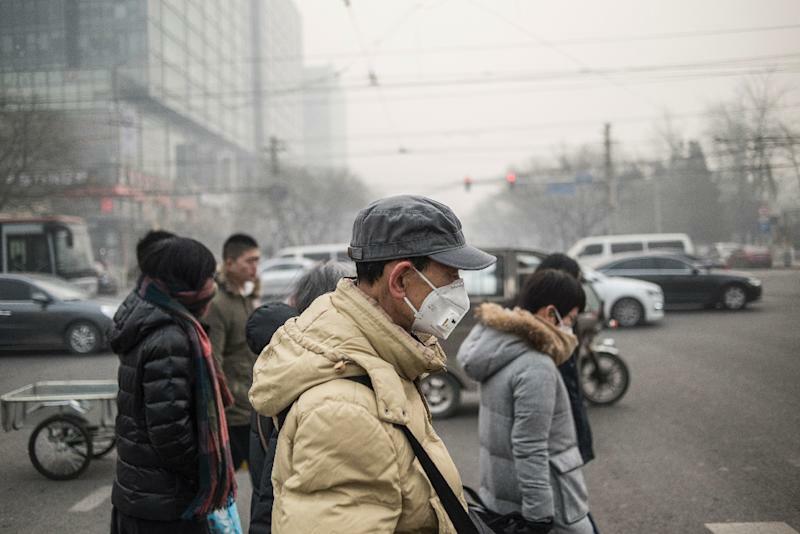 Such outbreaks are common across China, where Greenpeace in a recent study found nearly 80 percent of cities to have had pollution levels that "greatly exceeded" national standards over the first nine months of this year. Xi is in Paris for the first day of the UN Conference of Parties (COP21) summit, which aims to strike a global deal limiting dangerous climate change. China is estimated to have released between nine and 10 billion tonnes of carbon dioxide in 2013, nearly twice as much as the United States and around two and a half times the European Union. It pledged last year to peak carbon dioxide output by "around 2030" -- suggesting at least another decade of growing emissions. Most of the country's carbon emissions come from coal burning in power factories and homes -- which spikes in winter along with demand for heating, which also causes smog. "Will this long-awaited conference make your life different?" Xinhua asked its Twitter followers in a post linking the climate talks with the heavy smog. Beijing's severe pollution is expected to last until a cold front arrives Tuesday, the city's environmental protection bureau said on its website. "If the imperial capital is already polluted to such a level, shouldn't the environmental protection bureau leaders resign?" said one Weibo user.